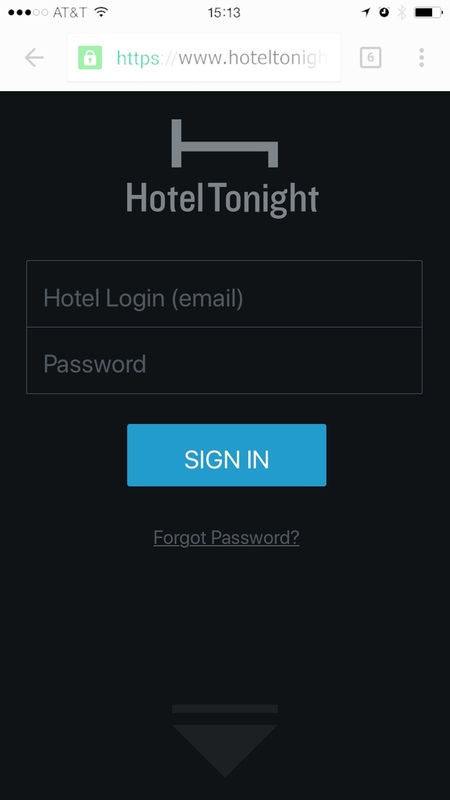 HotelTonight leverages 2 types of advantages in the OTA (Online Travel Agency) marketplace. The first is last-minute discounts for inventory that has persisted on other OTAs sites and has yet to be booked, and by discounting from the rates displayed on the other OTAs sites, HT will book that excess inventory with a mobile (Millennials demographic) user base. The second type is the maximum display of 15 hotels to bookers, this creates a competitive marketplace to drive deeper discounts for bookers by incentivising hotels to meet the threshold for display to bookers. 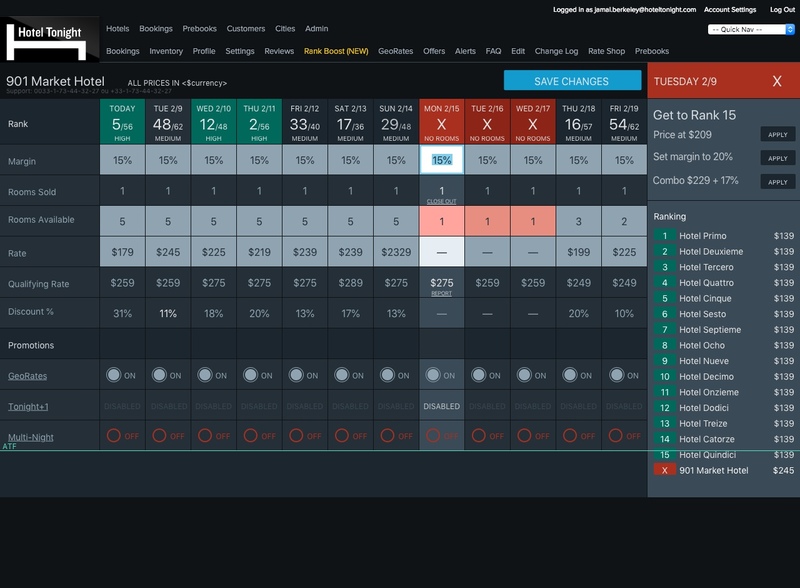 This project originated from 2 business requirements, to increase FPLOS (Full Pattern Length Of Stay), or hotel room inventory for dates beyond tonight, and Forecasting, providing hotel revenue managers with a tools to predict market demand based on room price as it relates to volume of inventory available. 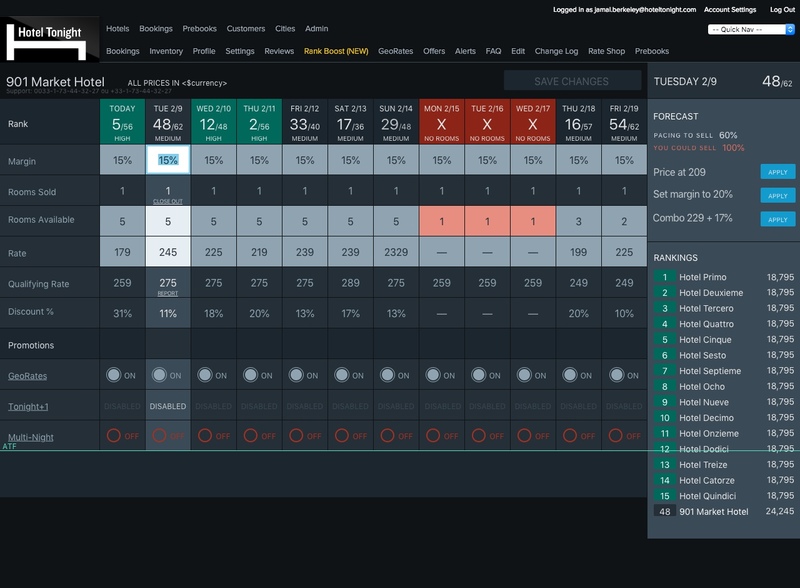 As a stretch goal, give the HTx Dashboard an re-organized and optimized design interface. User research was conducted with revenue managers to validate features, friction points and optimize value surfaced thru UX/UI flows. The initial task flows and forecasting features were then wireframed and iterated internally. 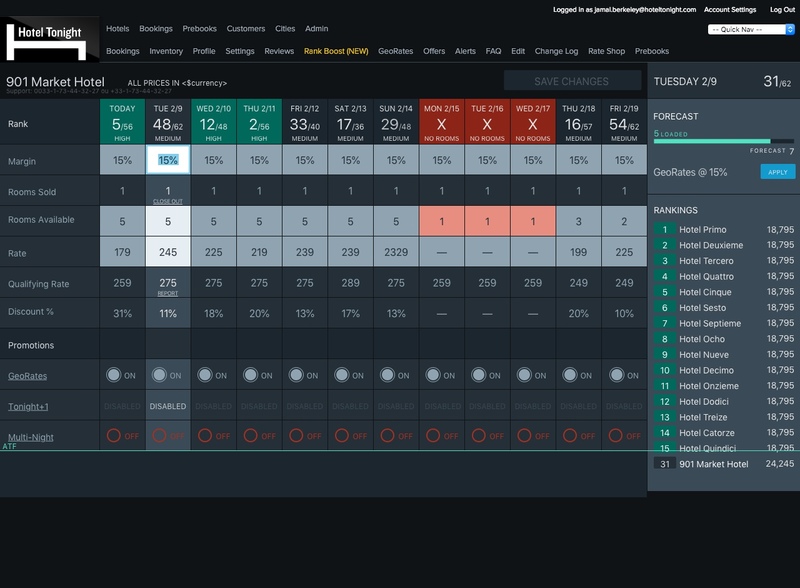 Then formalized into a inventory UI and presented to engineering, and identified by engineering as beyond the scope of the time frame allocated. Then we pivoted to a second iteration, focused on leveraging existing codebase, and optimizing the experience for the feature updates and increased user engagement, with revised stretch goal of extending responsive layout to mobile. Leveraging feedback from live user testing sessions to validate feature updates and mobile UI was conducted weekly with revenue managers. Behavorial funnel analytics were tracked and evaluated with product & local operations teams for feature release. 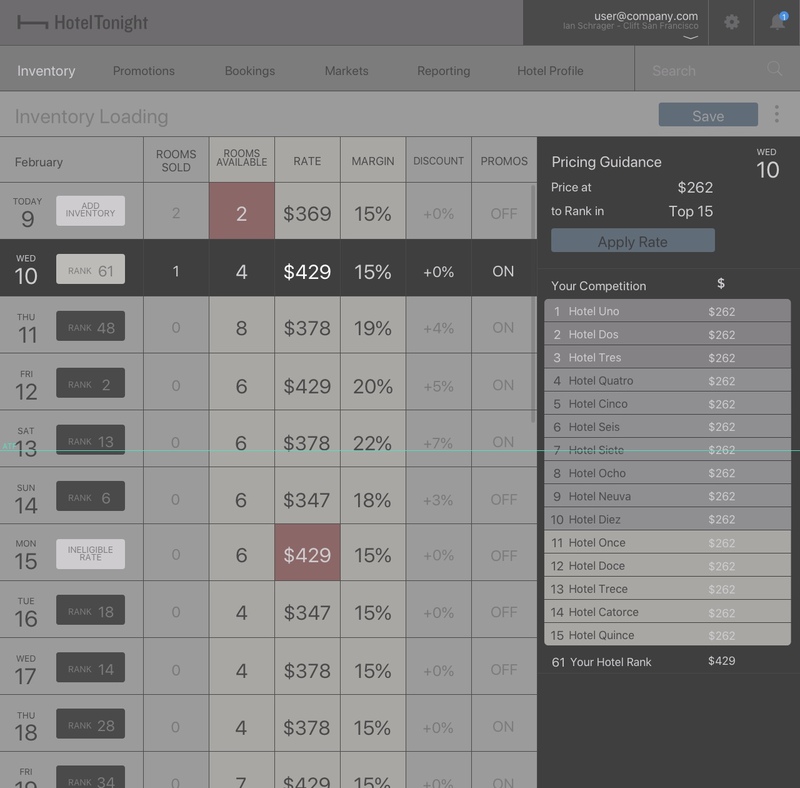 This feature update resulted in a 31% increase in room inventory loading on the HTx platform. Entire Project took 10 weeks to launch. 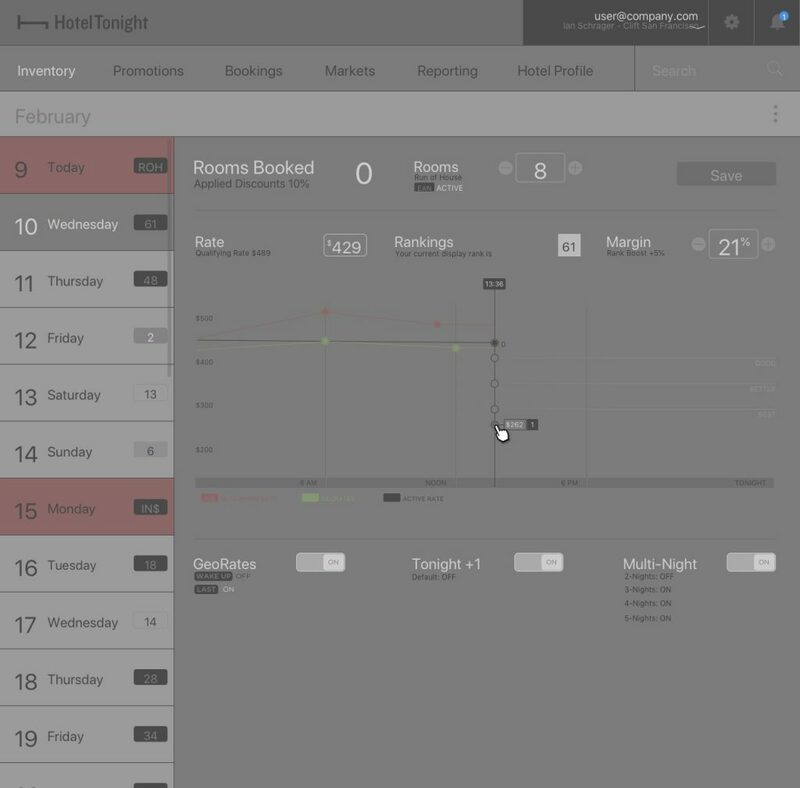 Dashboard used by 18K+ hotel partners to load room inventory on a weekly basis, usually on Sunday or Monday of each week, with last minute updates from either other managers with access from a desktop, or from a mobile web browser for a non-mobile responsive UI. • Qualitative feedback from hotel revenue managers on high level of data entry minimized time to enter FPLOS. • Qualitative feedback on the iterative friction created by not having a clear understanding of what target price and/or margin to set room inventory to maximize display ranking to bookers, and sell excess inventory for any given night. 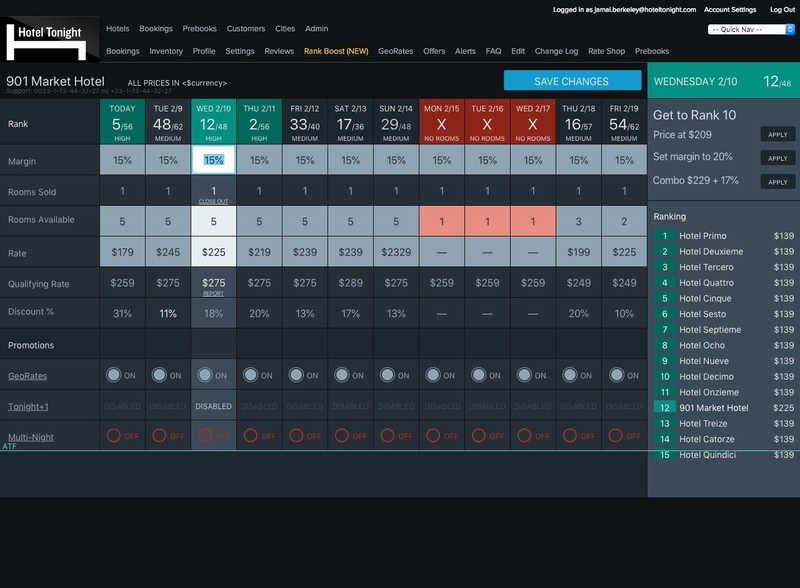 Hotel partner feedback on the HTx experience was one of friction around usability, focused on buried features and data. The task was to optimize the task flows, and surface status of each partner’s inventory in the HT marketplace. Early Exploration of Data Visualization of Display rankings with Marketplace data over time of day to track discounts based on time of day and how hotel revenue managers incentivize discounting towards bookings conversion later in day. 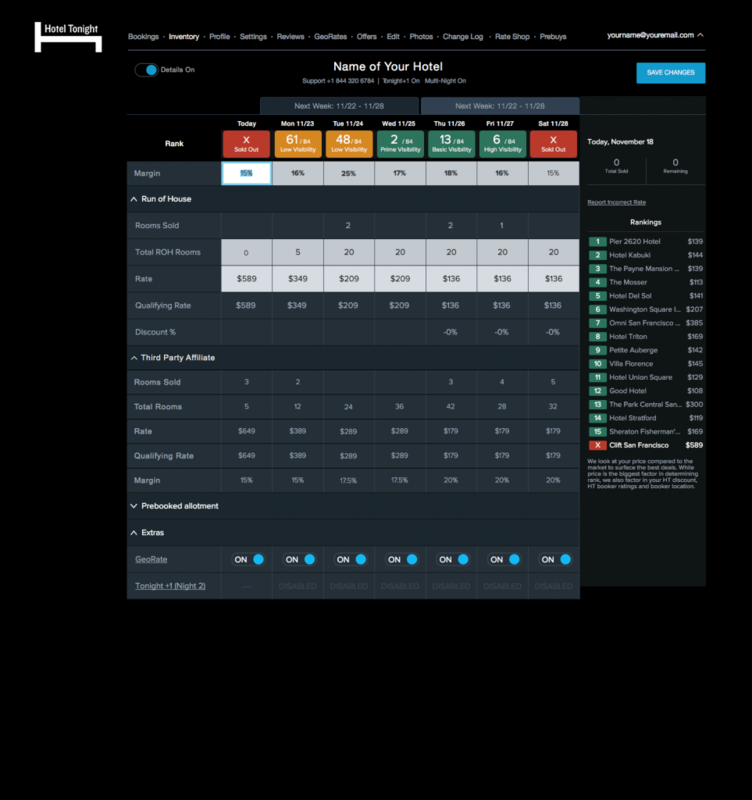 • Showing how to provide guidance in a dynamic marketplace, with both historical and current rank guidance combined with promotions like Georates. Exploration of vertical inventory loading with an understanding that the future business model would increase from the current 14 day window to 3 months. • Vertical Inventory calendar visually highlights direct correlation between active date, room rate, margin percentage, with Rank Guidance and Display Ranking. • This is an exploration of the most minimal data set for inventory loading. • Designed to optimize speed of inventory loading. Initial UI pass for presentation to engineering for estimating developmental scope and delivery. 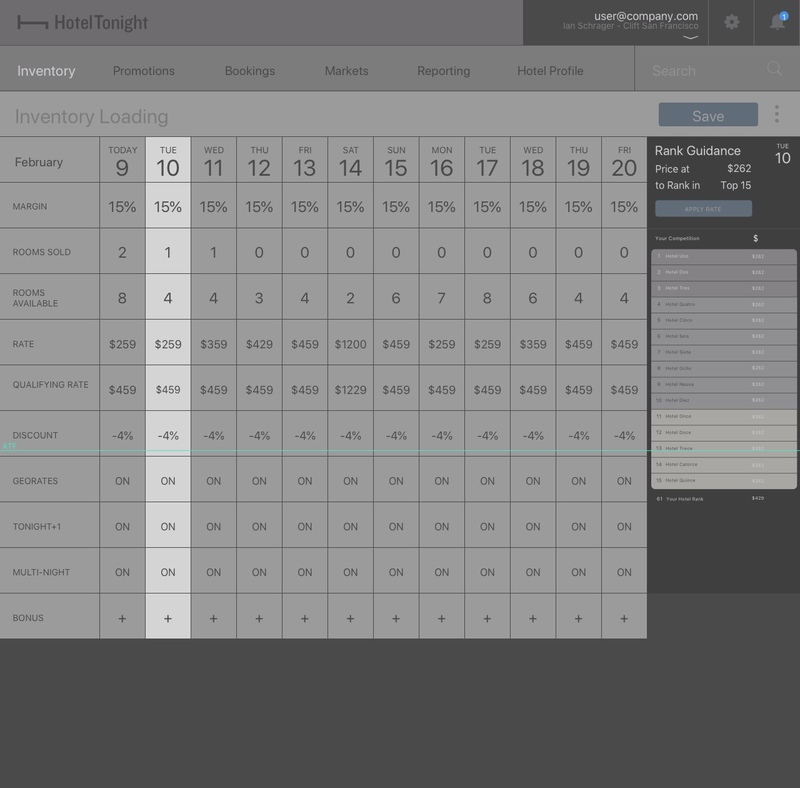 From the initial phase of a redesigned dashboard experience, a focused design iteration on increased FPLOS (Full Pattern Length of Stay) inventory loading, forecasting of inventory by metro, and simplifying the data entry required to post inventory for display in the HT marketplace. 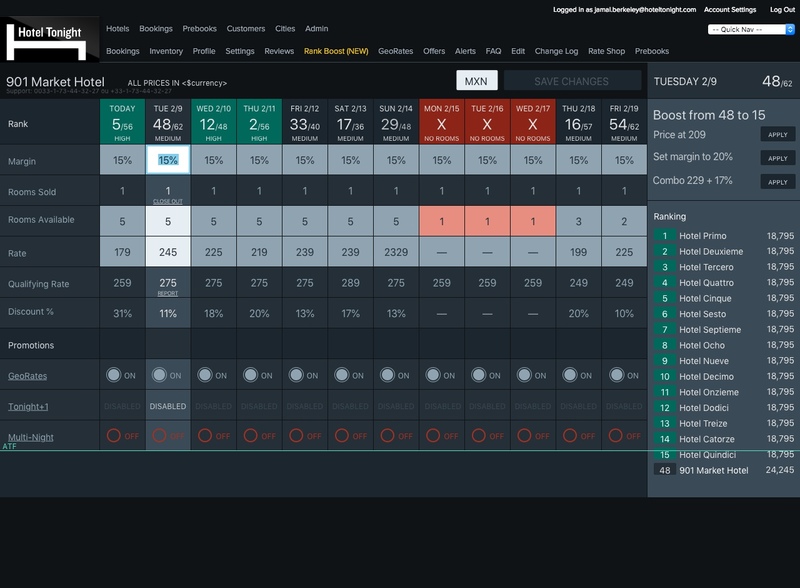 This round focused on a 12 day inventory loading pattern based on the mobile clients having a 7 day advanced bookings window plus a maximum of 5 night stay. 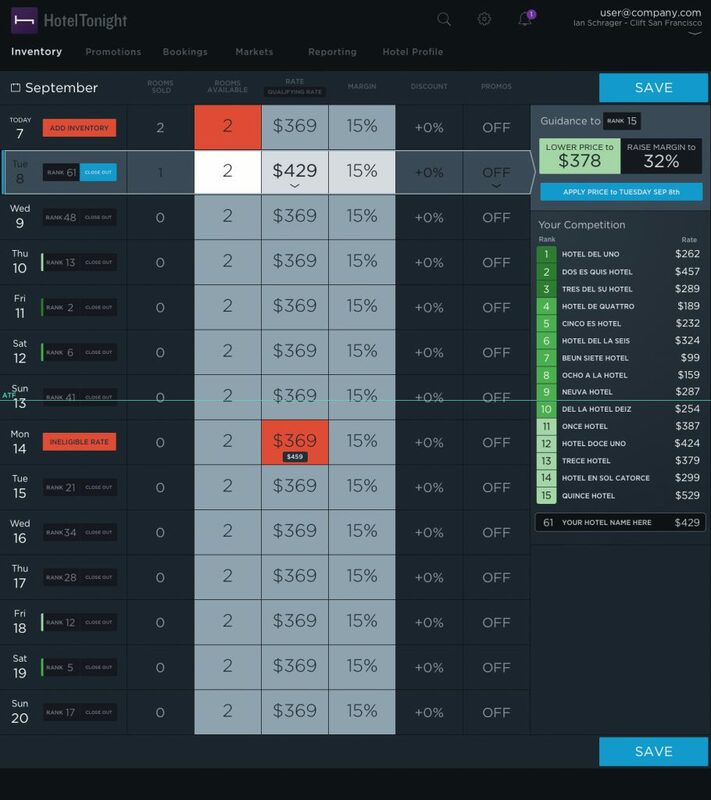 Correlating realtime display of inventory prices with display rankings and forecasting. Reduction of data entry fields to expedite the time to load inventory for hotel revenue managers. Wireframe validating 12-day grid and reduced data entry fields was a viable solution with desktop display specifications of core user base. 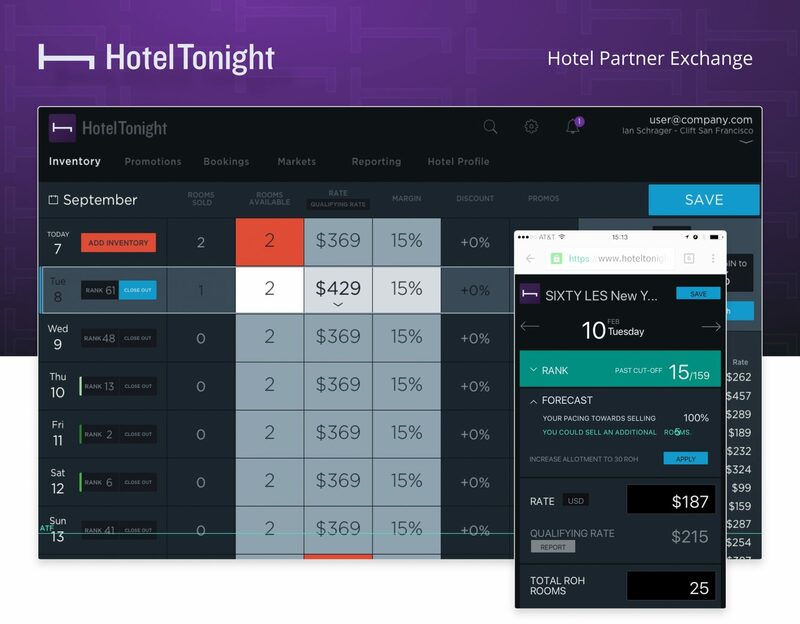 Hotel Partner revenue managers while using the desktop site to load FPLOS (Full Pattern Length of Stay) room inventory into the HTx Platform. Frequently, those same mangers are required to make last minute updates and manage inventory for tonights’ room allocations while away from their desktops. Note: The vertical centering of the fonts is offset when re-rendered from personal computer.